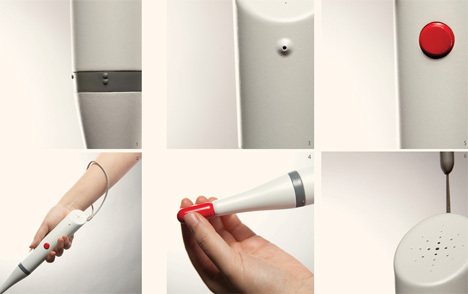 Products for the blind have traditionally focused on translating visual information into information that can be interpreted by other senses such as touch or sound. 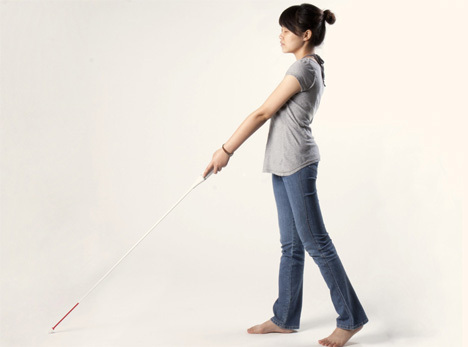 This cane designed by Xun Ye uses both sound and touch along with GPS navigation to allow blind people to get to their destinations easily. 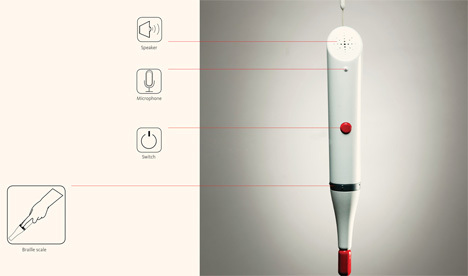 The Origin cane contains an integrated microphone and speaker in the handle; the speaker asks the user where she wants to go and the user speaks a destination into the microphone. The internal GPS calculates the directions and distance from the user’s current location to her destination and guides her there. A rotating Braille band at the base of the handle tells the user how far there is until the next turn. The speaker and microphone are both textured to make them easy for the user to find using her fingertips, and the single multi-purpose button controls all of the cane’s functions to avoid confusion. According to the designer, this is a product that could easily be produced today using technology that already exists – but at this time it’s just a concept. See more in Unbuilt Concepts or under Technology. July, 2011.